Brazil’s most famous city is undergoing a makeover as it prepares to host the World Cup next year and the Olympics in 2016. Duncan Madden hopes Rio still has a dangerous side. 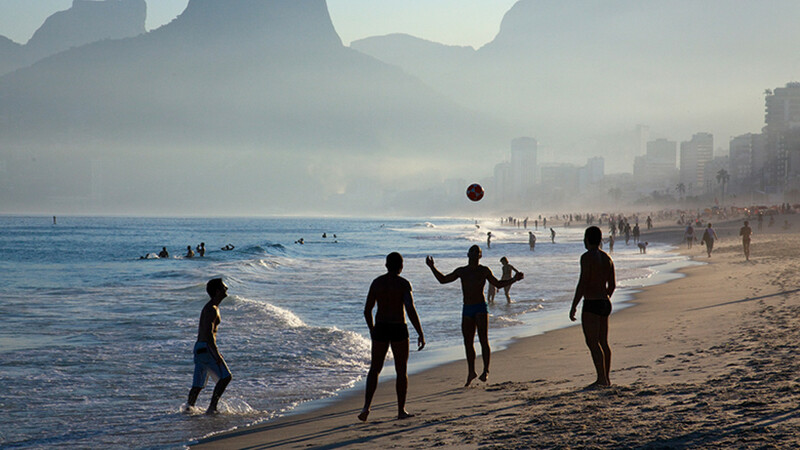 As our planedips its nose over glistening beaches and thriving forests towards jutting mountains and the pulsating heart of South America, I ponder the familiar stereotypes of Rio de Janeiro. This is Carnaval city. 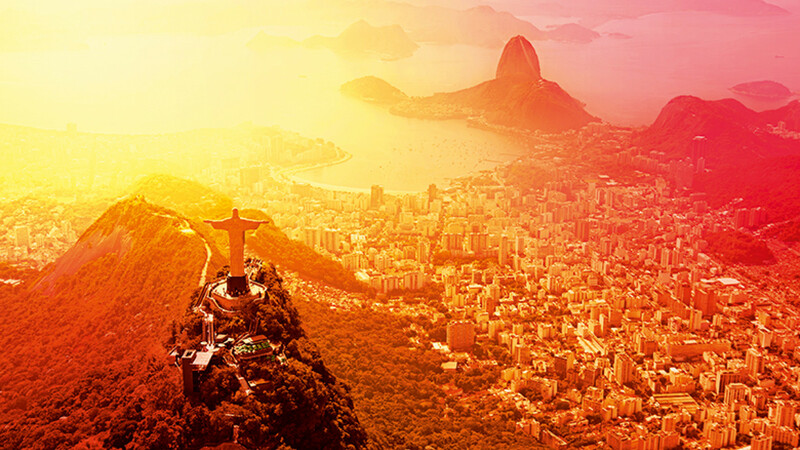 Brazil’s party metropolis, awash with storied history, sun- drenched beauty, celebrated extravagance and the lurking threat of danger. I’d wanted to throw myself into its hedonistic delights since I first saw pictures of empty blue waves and teeming multi-coloured streets as a wide-eyed, itchy-footed teenager. But in truth I had no idea what to expect. If the upcoming Olympics and World Cup PR juggernaut was to be believed then Rio really has become the utopian paradise I once imagined. Gone would be the gang and street crime that tarnished its tourist veneer, cleaned up the comunidades (or favelas) where millions lived in unsanitary poverty, fixed the power lapses and infrastructure problems. Yes, this would be a city fully prepared for its place in the world’s spotlight and every bit as perfect as those glossy brochures would have you believe. Disembarking at Galeão International Airport is not a promising start. Rundown and chaotic, it's a grinding effort to navigate in the cloying December heat, while leaflets spouting gentle advice about how to minimise the chances of being kidnapped did not stoke our anticipation of what lay beyond border control. But no matter, because once we’d navigated the airport officialdom and were trundling towards the city proper, Rio treated us to a glimpse of its dazzling beauty. With the sun sinking in a ludicrously flamboyant display of oranges, the city’s mountains cast lively shadows over its architectural mishmash and cariocas (Rio locals) spewed forth onto the streets in what looked like a loosely organised riot. It was instantly intoxicating. We’d decided to stay in Ipanema after much conflicting advice from friends and natives. Some claimed that along with its infamous neighbour Copacabana it has become too touristy, tacky even, and that to get a less commercial experience we should stay in a quieter, ‘more leafy’ district. No thanks – we weren’t here for ‘leafy’, but to get stuck into the thick of it. Bags dropped, we hit the evening streets and met up with some local friends. It’s always true that seeing a city with the natives will get you acclimatised to its hidden delights more quickly than in Rio. It’s a confused and confusing place, easy and scary to get lost in, overwhelming to the senses and sprawling enough to miss the really good stuff beyond the usual tourist trappings. But make the effort beforehand to get some insider tips and if possible hook up with some locals no matter how tenuous your connection to them. If you can manage this, the mysterious city will happily lift the layers of its petticoat to reveal the hidden treasures. 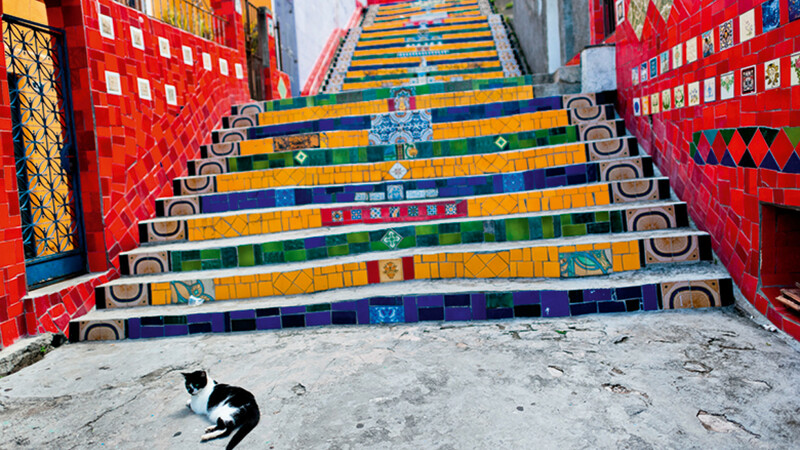 Our first port of call was Santa Teresa, affectionately referred to as ‘up the hill’ by our carioca compadres. Not the easiest district to get to as taxis aren’t always keen to drive up there, it’s worth persevering for. The Bar do Mineiro is a local favourite endowed with epic views, easy atmosphere and huge feijoadas – the staple beef, pork and bean stew that fuelled our bellies for much of our stay. Washed down with the obligatory caipirinhas it was just the introduction I’d hoped for. We wandered back down the hill along the extraordinary Escadaria Selarón (Lapa Steps), easily distracted by the buzz of young partygoers spilling from botecos. Cheap and lively bars, they pepper the streets and considerably delayed our arrival in Lapa, the district most famed for its late night delights. We dived into the sweaty confines of samba club Democraticos. 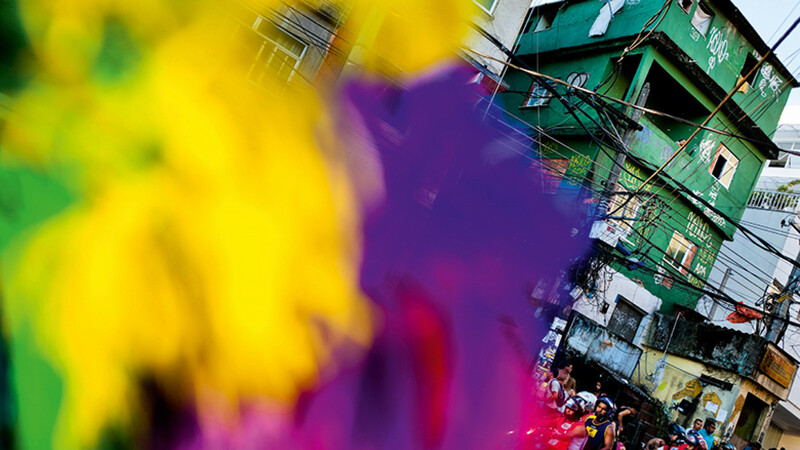 A cliché it may be, but Rio is a city that dances – and music is the lifeblood of its vibrancy. These aren’t the stuttering, robotic attempts at samba typical of a Tuesday night get together at the local community centre, though. This is a whole different story. It’s sweating, writhing, fast-paced foreplay – and the locals know it. My friend Marina tangled with a particularly snake-hipped chancer who immediately whispered in her ear, “Darling you can boss me around anywhere, but here... here I control you.” Smooth, if unsuccessful. 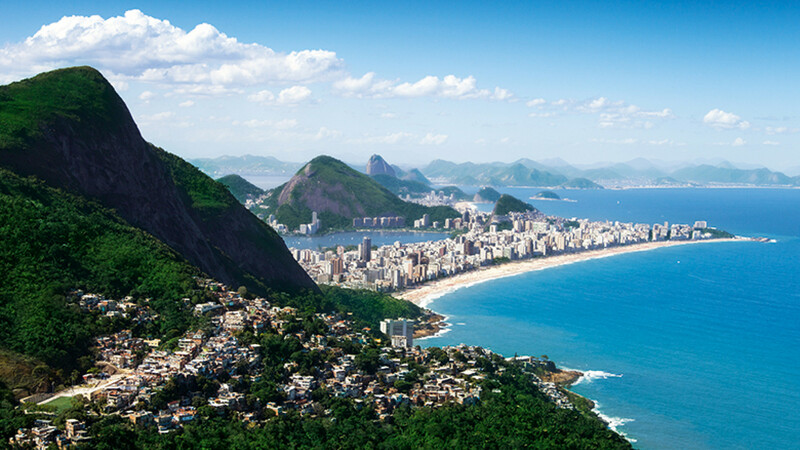 Daytime Rio offers a fine-dining buffet of amazing stuff to do. Hoping for some surf but with the legendary city breaks at Arpoador and Leblon uncooperative, we settled down for breakfast on the beach and a gawp at the local wildlife. As we munched our way through countless exotic fruits and coal-grilled cheeses, we watched G-strings disappear up bums of every possible shape and size, vendors hawking their wares, families playing and stoners smoking – this is daily life in Rio unfolding. Sage advice says not to carry many personal belongings around to minimise your chance of being mugged, and the locals lead by example. Guys stroll the beach with nothing more than sunglasses and unsuitably tiny trunks, mobiles stuffed prodigiously into their packages. Following suit, albeit with less skin on show, we spent the next few days exploring Rio’s treasure trove of adventures. We got hot and sweaty in the crowds vying for the view from the Corcovado where the towering Christ the Redeemer statue casts its open arms over the city below. Keen for a break from the crowds and something adventurous, we took our friend Fernanda’s advice and signed up to a tandem hang glide over the city. Silently wafting over Sugarloaf, Copacabana, Lagoa and the Guanabara Bay before gliding to rest and a cold beer on the crunchy sands of Sao Conrado beach was about as emotional and liberating as you can get while strapped to a complete stranger. I can’t recommend it enough. There was culture, too. A trip to the Niterói contemporary art museum is worth it for the Oscar Niemeyer-designed building alone, and a stroll amid the botanical gardens offered welcome relief from the city’s incessant buzz. We took afternoon tea at the extraordinary and decadent Confeitaria Colombo (you can take the Englishman out of England, etc). Evenings passed in a blur of tasty foods and long, cold cocktails. The sliced sirloin at Baixo da Gavea’s Hipodromo, the goat and broccoli rice at Novo Capela in Lapa, bottomless cheap drinks on spontaneous rooftop bars known as laje. It was these less refined pockets of Rio that I found most enticing, and despite the nagging sense of some unseen threat (borne from expectation rather than experience), most welcoming. The PR promise of a newly gleaming and fresh-faced Rio is disingenuous but also unwanted, because its magic comes from its mystery. Our last day brought us to the fringes of Complexo do Alemão, the favelas infamously ‘pacified’ by Brazilian special forces in 2007. Opinions vary on a place for tourism in the favelas; where some are keen to show their progress, others grumble as swathes are demolished for the Olympic clean-up with little concern for their residents. We saw progress and poverty in equal measure – the new cinema connected to a fizzing web of free-hanging power lines; shops and banks interrupted only by open air urinals; children kicking balls against walls daubed in political graffiti. Our guide choreographed the walk well, and I was glad to have him. We saw no trouble but I imagined many of Alemão’s less salubrious aspects were carefully masked from tourist eyes. We found ourselves back on the Lapa Steps that night, wandering through knots of partying cariocas down to a tangle of alleys and archways. Around midnight, as we fought through the mass of dancers, drinkers, drug takers and crossdressers gyrating to the pulse of a hundred stereos and live MCs on every corner, we took a breather from the madness in a quiet corner. A street vendor saw his opportunity and wheeled his CD-laden bike towards us, keen to demonstrate his sound system and earn a few reals too. His music blared and my friend Sim, fuelled on the hedonism of the moment, started to dance. Before we knew it we were engulfed in a flashmob of eager new partygoers emerging from every doorway and another party was instantly under way. Rio is a fuse begging to be lit, and it takes only a tiny spark to set it off.